Well, Stevie spears is busy, still lazy, but making improvements. 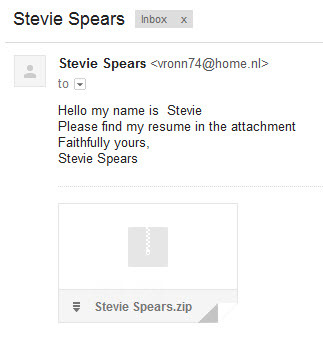 Not an hour after posting a weak attempt as phishing /virus spreading /who knows what by sending out emails with .zip file attachments, another email from Stevie, but this time some improvements where made. Hmm, well, actual body content…and vague yet specific enough to generate curiosity if sent to the right person. Remember, if you don’t know who it is, don’t open the attachment. If you are a person who may hire people, you should expect a PDF vs. a ZIP file.